The grape and wine sector in British Columbia has undergone vast transformations over the last few decades, from mostly bulk wine production, based largely on hybrid varietals, to the production of high end, quality wines produced from announce grapes. This evolution has, in part, been mandated by the realization that British Columbia, with a limited supply of good land suited for the production of wine grapes and the relatively high cost of production, can no longer economically compete in the inexpensive bulk wine segment of the market. 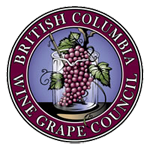 The BC Wine Grape Council is proud to announce that we are offering our Best practices guide free to download. Download by clicking on the desired chapter below.